WOW! That’s amazing, I just came across your blog and thought I would write a note because most people just don’t understand how time consuming all the badge work is! Congrats on finalling all getting it sewn on. 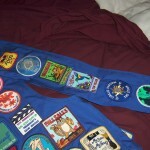 I have been in Girl Scouts for 2 years now(just bridged to Cadette 2 weeks ago) and i only have 7 badges. You earning all of those badges takes real dedication. I wanted to find a good girl scout website and well… here it is!!!!!! Mom must have gotten tired of taking you to mettings at one point. I have many questions for you so if you could e-mail me it would be wonderful. GREAT JOB EARNING ALL OF THOSE BADGES. It must have been like the entire badge book. Congrats Katie! I shot you an email… I’m happy to answer any questions you might have! Don’t get discouraged! It’s been 10 years since I was a scout, and I do intend on putting some badge work help up here soon, but I need to get the new badge books to make sure I’m not giving out dated info on badges that don’t exist anymore! Hello! I despretly need tips for earning badges. Do you have some? Hi Lizzy! As soon as I get the new badge books, I’ll be posting some tips. Stay tuned! Feel free to let me know what badges you’re interested in and I can focus on them first! im working on the just jewelry. That’s awesome. It reminds me of my role model from when I was in 6th grade. She was a senior girl scout in 12th grade (this was way before the ambassador age group) and had to have two sashes for all her awards. She had them criss-crossed so she could wear them together. I saw that and really wanted to do the same. I didn’t quite match her but I managed to fill up one sash. I was in girl scouts during the switch from blue to khaki. I didn’t even bother trying to put all the fun patches that go on the back because I have too many of them. 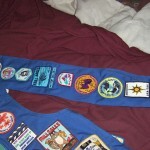 I now work with a family friend’s troop and am a life member of the girl scouts. I think this is awesome that you put your vest on the internet. Hopefully it will inspire younger scouts to do their best and try to get every experience they can while in scouts. Hi! I just started Girl Scouts and I’m a junior. Do you have any tips on earning badges? I only have 6 badges. Start with the easier ones and work your way up to the more difficult ones. You’ll get the hang of it. I’m working on adding some badge help tips here, so let me know what badges you’re interested in and I can focus on those first. Hi! I like art. So I’m focusing on those type of badges first. So far I have these badges: caring for children, let’s get cooking,outdoor cooking,camping,and the cookie connection. Thanks! There are so many beautiful patches to be earned. I love how cool they look when they are all sewn together like this. What a wonderful keepsake! WOW that is alot of badges, I wish I had that many! 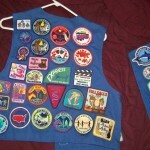 I am a juilette cadette girl scout and I only have two badges! Do you have any tips on earning badges? Also did you earn all these badges with a troop our on your own? I am a juilette cadette girl scout and I only have two badges! Do you have any tips on earning badges? Also did you earn all these badges with a troop our on your own? I’ve been in Girl Scouts since I was a Brownie. (: Now I’m a senior and working on my Gold Award. My vest is covered front and back and soon I’m getting a sash to continue on my work. Your vest looks wonderful! AWESOME JOB!!! You must have been an awesome girl scout! Just courious, why are there some juinor badges on your vest? At the time, any junior badge with a tan background was allowed to be displayed on your Cadette/Senior vest/sash. This was before Ambassador scouts even existed, as my last year in Girl Scouts was 1999. I’m not sure if the rules are the same now or not. I was wondering if cadettes can still earn tan back badges? I am still amazed by this!!!! It inspires me to get badge earning!!!! On average how long did it take you to complete each badge? AMAZING!! Just wondering if you remeber what you did for your silver award, looking for ideas to get mine. Thanks!!!! 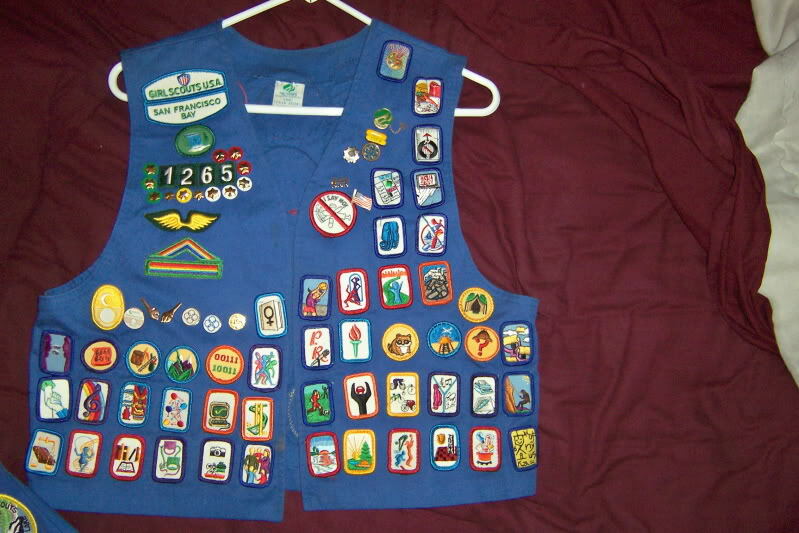 I love your uniform, but have you seen the new girl scout catalog, they have retired every badge you earned. Please write your GS executives to restore our badges or else what are celebrating in the year to come? Do you have a link to the online catalog? I did read something about a year ago that said they were going to be retiring some and de-emphasizing earning badges, which I think is really the wrong way to go. If you have a link, please share.